Winter came with its baggage — rain, snow, strong cold winds and also some gifts. Indeed, Christmas is coming and straight from Santa Clause’s eventseeker bag, here are the best December festivals in the world. Throw some of these on your Christmas wish list. Happy holidays to all you eventseekers! Details : Join the evolution of light and sound that’s taking place in Houston, TX. This experiential festival combines music-alternative, electronic, hip-hop and digital art. The programming for this new edition features artists such as, Kendrick Lamar, CocoRosie, New Order, Children of Pop and Hearts of Animals. They will perform on three different stages (Red, Green, Blue) over two days. The two indoor stages are dedicated to live musical performances and the third, outdoor stage will showcase visual art. Details : If you are looking for something unique and intense, Burning the Clocks is made for you. 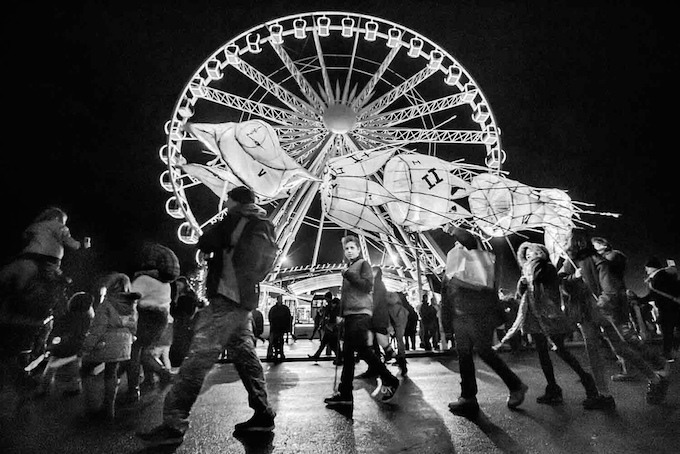 Marking the winter solstice, it’s a magical procession of brightly lit lanterns and art located in the city of Brighton, UK. The gathering was created in 1994 and it invites people to get involved by creating their own lanterns. The event is a kind of little sister of the iconic Burning Man festival, in the Nevada desert. The participants of the parade burn lanterns on the beach for safety reasons. Burning the Clocks carries the hopes and dreams for the new year, and allows participants to say goodbye to the past year. Details : It’s a colorful, cultural and musical carnival held in Nassau, Bahamas. Junkanoo is an amazing celebration of life and freedom, dating back to the 17th century and celebrated each year. For Bahamians it’s a important parade honoring their heritage as a testimony for their ancestors slaves. It’s a familial event for all ages. The parade is organized and judged in three main categories: Best Music, Best Costume and Best Overall Group Presentation. Details : Contact 2015 is the largest indoor electronic music festival in Western Canada. The two-day event takes place on the two stages at the British Columbia Place Stadium. For its fourth edition, it will be headlined by some of the world’s most coveted dance music DJ’s and producers, such as Above & Beyond, Hardwell, Steve Angello, Andrew Rayel, the Grammy-nominated hit maker DJ Snake and many more artists. Details : If you are planning to go to a festival in December, Sunburn is a must-see-event. During four days, the festival combines electronic dance music, food, shopping and entertainment. The 8th edition, held in a gorgeous beach venue, features the biggest international artists, such as Dimitri Vegas & Like Mike, Martin Garrix, Felix Jaehn, David Guetta, and many more artists across five monolithic arenas. Details : Held in the southern mountains of Lake Tahoe, Snowglobe Music Festival is the perfect place to combine music, nature, dancing, skiing, snowboarding and New Year’s Eve celebration. More than 50 (mostly) electronic artists — Post Malone, E-40, Chet Faker, Galantis and also Jai Wolf — will perform on three stages. The main stage is outdoor and uncovered, but the warm ambiance will help attendees face the evening temperatures. What better way to start a new year than surrounded by music with confetti and fireworks? Details: For the end of year, head to Scotland and enjoy the experience of the very best traditional Ceilidh event. The Hogmanay Celebration, held in High Street & Parliament Square, features live music from Cask Strength Ceilidh Band, Ceilihdonia, Whisky Kiss and Sporran Again. It’s a traditional festival, with fireworks, a parade and music — all with a Scottish twist. Edinburgh Hogmanay – Street Party 2015 from Edinburgh’s Hogmanay on Vimeo.